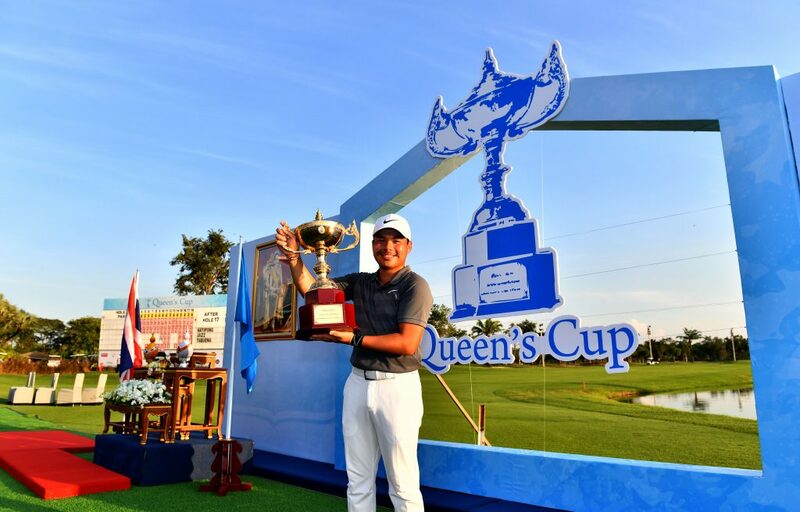 BANGKOK-THAILAND- Miguel Tabuena of the Philippines pictured with the winner’s trophy on Sunday, December 2, 2018, during the final round of the Queen’s Cup, hosted by Jaidee Foundation at the Legacy Golf Club, Bangkok, Thailand. Picture by Paul Lakatos/JF. Miguel Tabuena of the Philippines signed for a stunning four-under-par 66 in the final round of the Queen’s Cup hosted by Jaidee Foundation to end a three-year title drought on the Asian Tour. American Johannes Veerman made a charge on the final day after carding a bogey-free 66 highlighted by four birdies, but he was unable to catch up with the relentless pace of Tabuena and settled for second place on 263 at the US$500,000 event hosted by Thai legend Thongchai Jaidee. The Queen’s Cup is celebrating it’s 11th edition on the Asian Tour this week and Thongchai assumed the responsibility of hosting for the first time on the region’s premier Tour, in his efforts to draw attention to his foundation. 260 – Miguel Tabuena (PHI) 65-63-66-66. 263 – Johannes Veerman (USA) 62-65-70-66. 264 – Jazz Janewattananond (THA) 65-63-68-68. 267 – Natipong Srithong (THA) 66-66-65-70. 268 – Chapchai Nirat (THA) 70-69-64-65. 269 – Shiv Kapur (IND) 69-68-65-67, Sarit Suwannarut (THA) 68-66-67-68.